How to Declutter Your Craft Supplies and Make Room for the Good Stuff! Welcome to the first post of my craft organization series! I’m so glad you’ve decided to join me! This series is going to help you create a beautifully organized, Pinterest-worthy craft stash that you’ll be proud to show anyone and everyone! 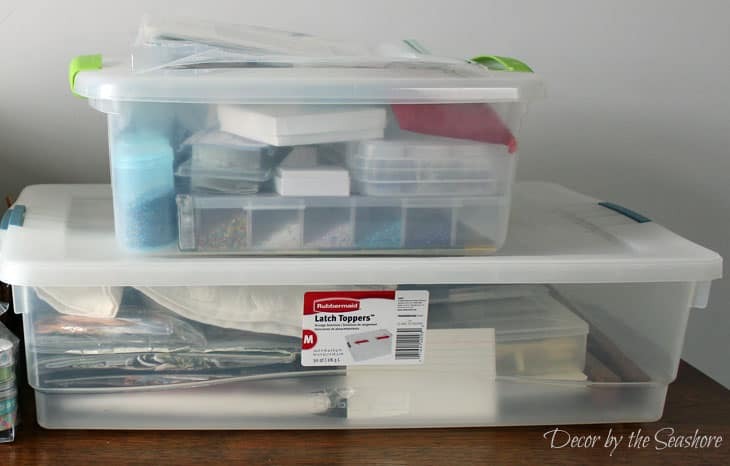 Today’s post focuses on the first and most important part of organizing your craft stash: how to declutter your craft supplies! Today’s post will help you sort through everything in your stash, prioritize what to keep and what to get rid of, and find a new home for the items you’ve deemed unworthy of being in your craft stash. That’s right… unworthy! 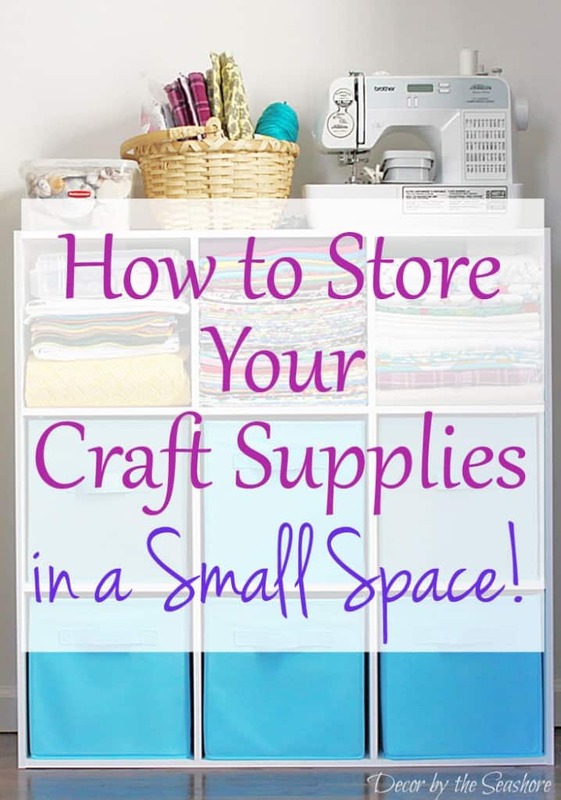 Because when it comes down to it, no matter how much space you have to store your craft supplies, at some point, it will run out. Therefore, every craft supply you own should hold some sort of meaning, value, or use to you. If it doesn’t, it’s just taking up valuable real estate! Decluttering your craft stash is going to be one of the hardest parts of getting your craft stash under control. Let’s face it, it’s hard to get rid of things we’ve been holding onto for so long. And as crafters, you never know when that extra piece of paper or scrap of fabric can come in handy, right? But all those little scraps add up, and eventually they become more of a burden than a help. That’s why it’s so important to sort through everything and get your decluttering on! 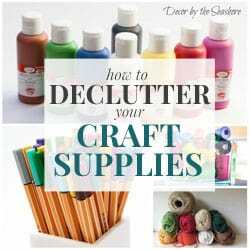 Why bother decluttering your craft supplies? Well, for starters, it will be easier to find things when you need them. You’ll be able to find what you need when you need it instead of sifting and sorting through random junk you’ll never use. You’ll actually have space for the materials you need and use. When you’re done, you should have some extra space. That means that the next time you buy something, you’ll actually have a place to put it! You’ll be able to easily see what supplies you already have and put supplies away where they belong without a lot of hassle. Sound too good to be true? Not if you put a little time and effort into it! Follow the steps below to start organizing your craft supplies and get your craft stash under control! Is the size of your craft clutter overwhelming, or are you short on time? No worries, just break the steps up into manageable chunks and get it done in bits and pieces! 1. First things first, put on some music, and make it upbeat! What you’re about to do will set you up for crafting success all year long, so put a little spring in your step and celebrate with some music! 2. Now that you’ve got the music going, it’s time to get out your craft supplies and gather them all together in one place. If you’ve got craft supplies spread throughout various rooms of your house, bring them all together so you can easily see everything you have! 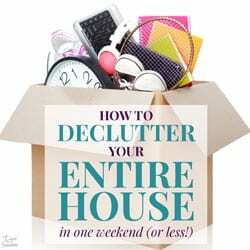 Get out those boxes and bins from the back of the closet, under the bed, and where ever else you have them stashed. Every nook and cranny you’ve got craft stuff stashed in should be included! It can be quite an eye opening experience to see how much craft stuff you actually have once it’s all out in the open! *Will I actually use this item for crafting in the near future? *Is this item in usable condition? *Is this a craft that I am still interested in and enjoy doing? If you answered yes to the questions above, then keep the item. If not, then put it in a discard pile and move on to the next item. Don’t second guess your decision, just keep going! Go through every single item in your craft stash and evaluate its worth. Decide whether that item is something you will legitimately use for crafting or if you’ve just been keeping it around hoping to find a use for it and still haven’t. Actually check to make sure that the supplies you’re keeping are usable. Open your paint bottles and make sure the paint’s not dried up. Anything that’s worn out or broken beyond repair needs to go. 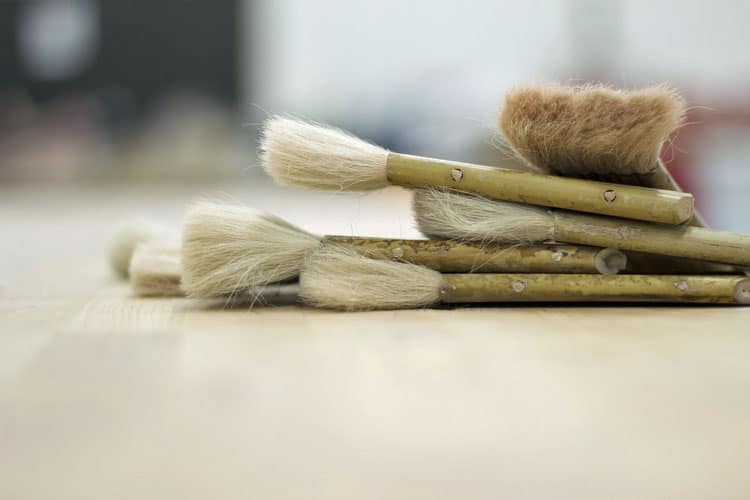 All the craft supplies you keep should be in good, working condition. They should be worthy of being included in your craft stash! 5. Make a plan of attack for the rest of your items. If there are items you don’t have a use for but you’re really having a hard time getting rid of them, find a use for them! If you’ve got a ton of scraps taking up space, check out my scrap busting Pinterest board for some scrap project ideas, and actually plan a time to make them! If you don’t want to bother with scrap crafts, then toss the scraps and move on. It’s not like you won’t be creating more scraps eventually anyways. 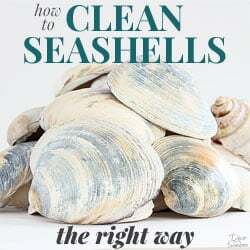 Follow Celeste @ Decor by the Seashore’s board Scrap Busting Crafts on Pinterest. Those crafts that you started and never finished? Use my craft planning calendar and set aside a date to actually complete them. 6. Find new homes for the rest of the supplies that are unworthy of your craft space! Sell them. If you have craft supplies that are still new or in good condition and worth a little money, sell them! 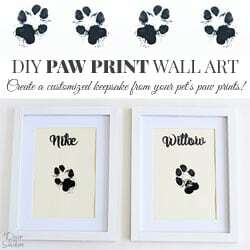 This can be a nice way to make a little pocket money to put towards your next craft! You can try selling your stuff locally at a yard sale or online on sites like Craigslist, Facebook, Ebay, or Etsy. Donate them. If you have some usable supplies that you can’t or don’t want to sell, consider donating them. If your supplies are appropriate for kid crafts, a teacher, school, or daycare might appreciate them. Ask friends and neighbors if they’re interested in your craft supplies. You can also look online for a local crafting guild or nonprofit that could use your supplies. Recycle or toss them. Those tiny little scraps of paper probably won’t be of use to anyone, but they can be recycled. If you can’t recycle it, into the trash it goes! Now that you’ve done the hard work of decluttering your craft supplies, make sure it stays that way! Regularly go through your craft stash and declutter it. Put a date on the calendar, maybe once or twice a year, to go through your craft supplies and get rid of the stuff you won’t use. And make sure to actually go through with it! Keep your craft supplies decluttered by not putting unusable things back into your stash. If you know that something is worn out or broken, don’t put it back into your craft stash. You’ll just be undoing all your hard work! When you go to the store, only buy the craft supplies that you need and will use. If there’s something you just can’t resist buying and you absolutely must have, then go ahead and buy it, but make a plan to use it so that it’s not going to just sit around collecting dust. If you buy supplies for a project and then end up not using them, return them if you can. I’m not about to let you go through this process by yourself, of course, so I’ll let you in on my decluttering progress. I’m getting rid of two bins (one with counted cross stitch materials and another with beading/jewelry making supplies) because I no longer do those crafts. I’ve had them for YEARS and haven’t touched them, mainly because I’ve lost interest, so it’s time for them to go. I have a ton of fabric scraps that I probably won’t be using anytime soon, so away they go (but that basket is totally staying!). I have some dried up paint and glue that I tossed, as well as some old scrapbook materials. Speaking of which, I found a red eye pen from the days before digital pictures and Photoshop! (Anyone else remember those?) I have a bag of scraps of ribbon, but let’s be honest, when am I really going to use that two inches of ribbon I’ve saved for years? I have a ton of fabric that I’ve had for years and never touched. There’s a lot of it, and it’s really colorful, so instead of getting rid of it, I’ve decided to use it up by creating pillowcases for children in the hospital for Cases for Smiles. I used to buy craft supplies without a project or idea in mind. You know, because it was cute or on sale or just something I decided I needed on a whim. 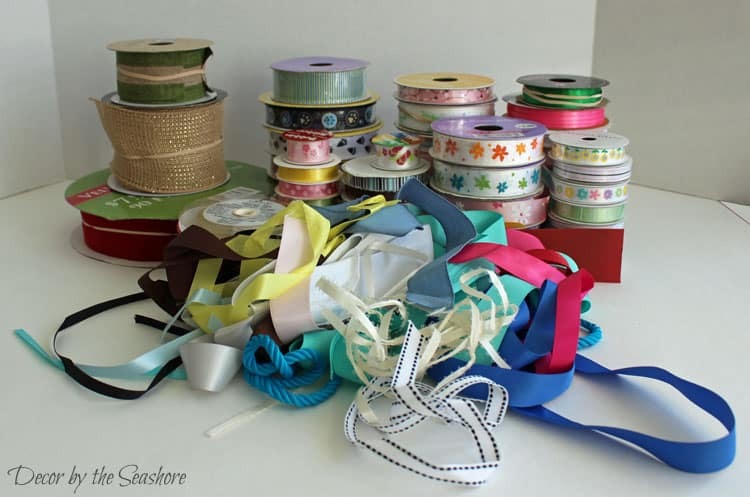 (Hence my ribbon collection… I rarely even use ribbon!) But the only thing that did was add clutter to my craft stash (and diminish my bank account)! So I have stopped buying materials I don’t have a plan for. I find that whenever I have a project in mind, I usually end up going to the store to get what I need anyways, and rarely do I find what I’m looking for in my own stockpile, so there’s really no need to have such a large craft stash. All I really need are some tools and a few materials here and there that I actually know I’ll use on a regular basis. Well I showed you mine, so it’s only fair that you show me your craft stash decluttering pictures on my Facebook page. Don’t be shy, show off your progress! Don’t make me do this alone! Get your family and friends in on the fun too. The more the merrier! The second part of the series gets into the really good stuff! I show you how to choose the right organization system for your craft supplies, even if you don’t have your own craft room or a lot of space! And the third part of the series shows you how to organize and arrange your craft supplies in your craft space so that you can always find what you’re looking for and get that beautiful look you always see in magazines and on Pinterest! Check them out! I hope you love this series as much as I do! Sign up for my newsletter below so that you can be notified of future posts, tutorials, free printables, and other helpful DIY tips! 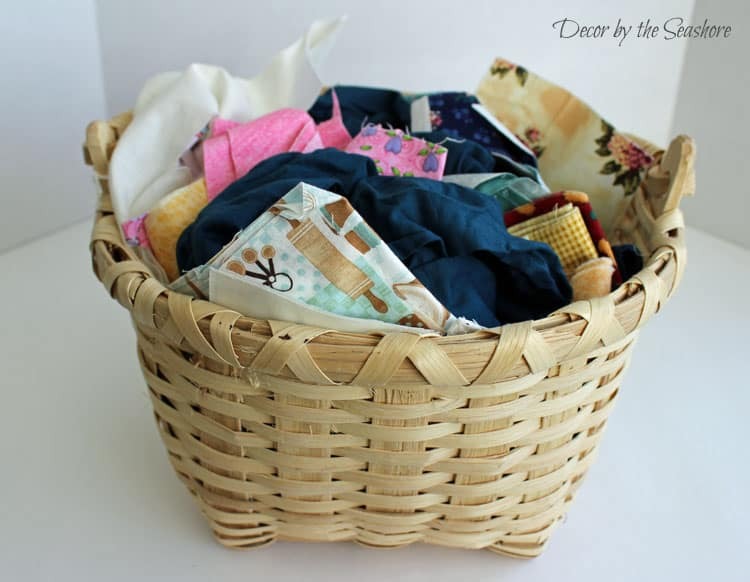 42 Comments on How to Declutter Your Craft Supplies and Make Room for the Good Stuff! I’m a total craft supply hoarder, LOL! I was, however, forced to start over from scratch the year before last when my basement craft room flooded and EVERYTHING had to be tossed. I’m trying to be better about only buying things I’ll use. I do need to go through my stuff and get rid of some of the excess though. Your tips are great! Jenny, I’m so sorry to hear that you lost your craft supplies when your basement flooded. That must have been so upsetting! I guess it gave you a good excuse to go shopping for some new supplies, though. I find that if you only buy what you are actually going to use, it really helps to keep the clutter under control. Good luck organizing! Celeste, my decluttering came to a screeching halt on the second step. Between me and my daughter we have so many craft supplies, strewn all over the house. I can see this is going to take a lot more deterimination than I had originally thought. I’ll try to keep up somehow. Bravo to you for making those pillowcases with the unused fabrics, that is a very kind gesture. 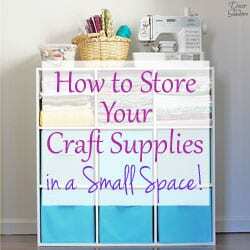 Mary, this can be time consuming depending on how big your craft stash is, but it’s definitely manageable! 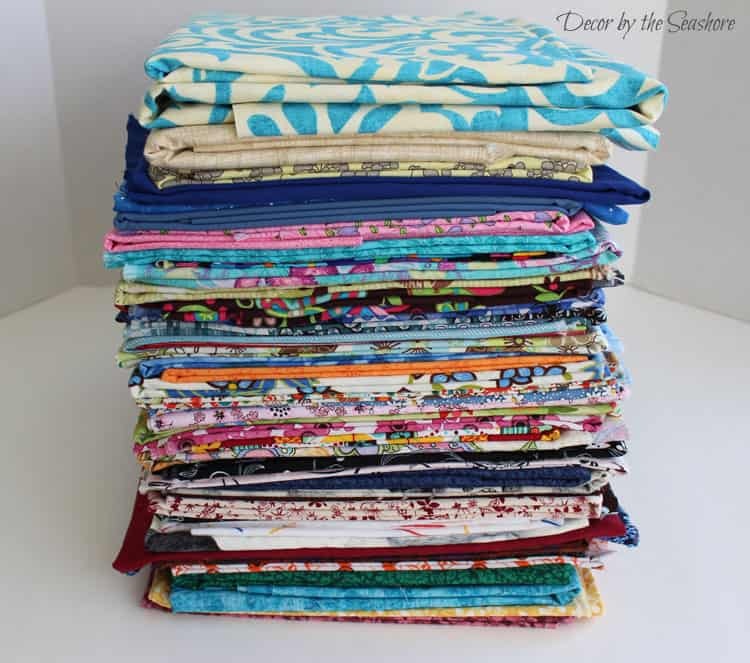 If your craft stash is really large or spread out, you might want to tackle one area at a time, like today I’ll do fabrics, tomorrow paints, etc. Or you could also divide it by room or floor (though I suggest doing it by categories so you can really get an idea of how much you have). You know your house and your craft stash best, so do what works for you. The results will definitely be worth it! We moved a a few months back out of the home we have lived in for over 16 years. I spent so much time purging my stash and know that once I move everything out of storage I will still have things that I need to purge. Lol Lindsay, if you lived nearby I totally would! That is how much I love organizing! Good luck getting your craft stash organized! Great post…. I seriously need to go through all of my clutter! This may be the motivation that I need! So glad you got some motivation from this, Tammy! I think once you start you’ll find it’s hard to stop. Good luck with the decluttering! 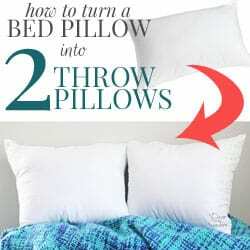 I really need to do this, but I get so scared of throwing something out then finding the perfect way to use it. 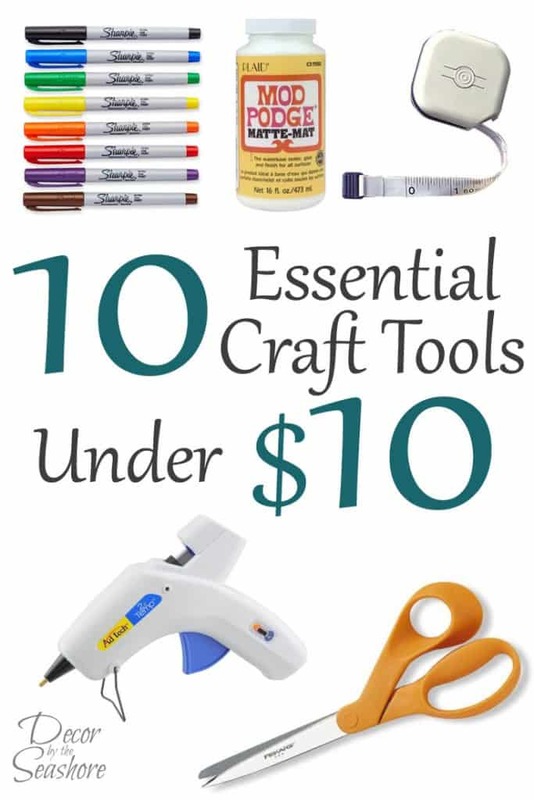 But only for craft supplies, everything else I love decluttering! The life of a DIY addict, huh? I should definitely get it all organized so I can get to crafting in 2016! I know, Kati, that’s the problem with craft supplies. You never know when you might need that random scrap of ribbon, right? I try to set a limit for my craft supplies, so if I have something that I haven’t used in say a year, out it goes! I figure if I haven’t used it by then, I’m probably not going to use it at all. Good luck decluttering! I did this when we moved last year but I think I need to do a round two purge, I’m sure there is still a bunch of stuff that I am really never going to use! I was able to give a lot of yarn to a knitting club and most of the rest of the stuff I turned out to my super creative niece who is 8 and hasn’t really had time to build up a stash yet. So glad you got some inspiration from this, Julie! It’s a great idea to do a thorough decluttering once a year or so to make sure the stuff in your stash is the stuff you’ll actually use! I did a series in October on decluttering my sewing room, the crazy stuff I had! I didn’t even get to the craft stash. Oh my gosh, I know, if you have a lot of stuff, it can take a while! If you break it up into bits and pieces, it’s much more manageable! Good luck! Thank you so much for the craft planning calendar. With an active toddler who loves doing everything all at once (because it’s all readily available) and then gets bored doing the same things over and over, that’s just what I need to keep my sanity! So glad you’ll get some good use from the calendar! 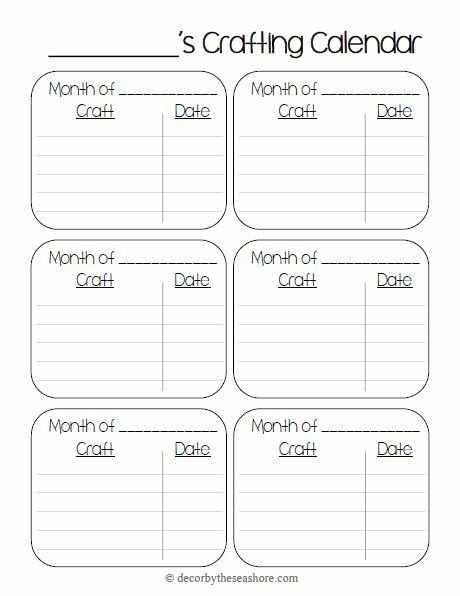 It’s really helpful for planning your crafts ahead of time, especially with little ones around! Definitely some great tips here! That’s a fantastic idea, Janet! I’m sure senior centers would be thrilled to get craft supply donations, especially if they can put them to good use and raise a little money. 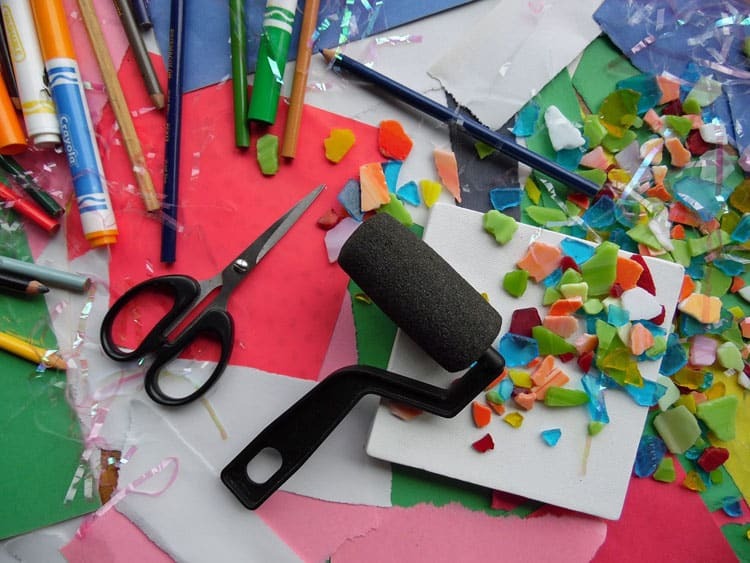 There are so many places that you can donate old craft supplies to instead of letting them collect dust in your home or just throwing them away! These are some really great tips! I love to paint and sew and I try to tame the amount of craft supplies I have. Last year I went through and sold, donated and trashed more than half my supplies, it was a huge weight lifted off my shoulders! I was able to be more creative without all of the stuff crowding my brain! Plus we had a garage sale so tons of others were able to enjoy what I wasn’t using. A win win!!! So glad you found this helpful! You know I’ll be back to party with you next week! Great tips! We’re going through a massive overhaul on our house and de-cluttering is #1 on the list. I got rid of so many craft things and it felt so good. 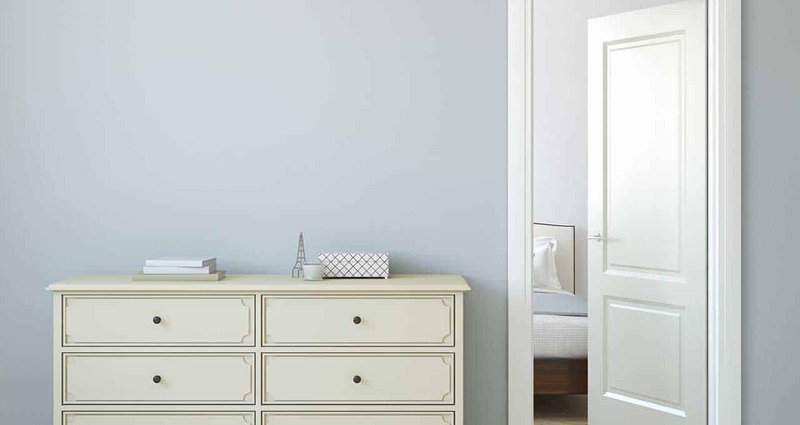 There’s nothing quite like having a clean, decluttered house! So glad to hear you’re starting the year off on the right track! I am a huge purger . . .except for my craft supplies. However, I am an organized craft supply horder . . .at least for now. What saves me is making several project using what I have. Makes me get a little creative sometimes, but it really helps keep the supplies in check. Looking forward to following along! Thank you for joining us for Brag About It! I know, Laurie! Of all the things, my craft supplies the hardest to declutter, because you just never know when you might need that little scrap of fabric, right? I find that it helps to try and find projects for the supplies that you have and don’t want to get rid of! I know, it can be so hard! It seems like every craft item has potential use for something, doesn’t it? I don’t know how many times I’ve gone into my craft storage and come out frustrated because it’s so filled with junk. The way you are with ribbon is the way I am with cardstock and fabric! 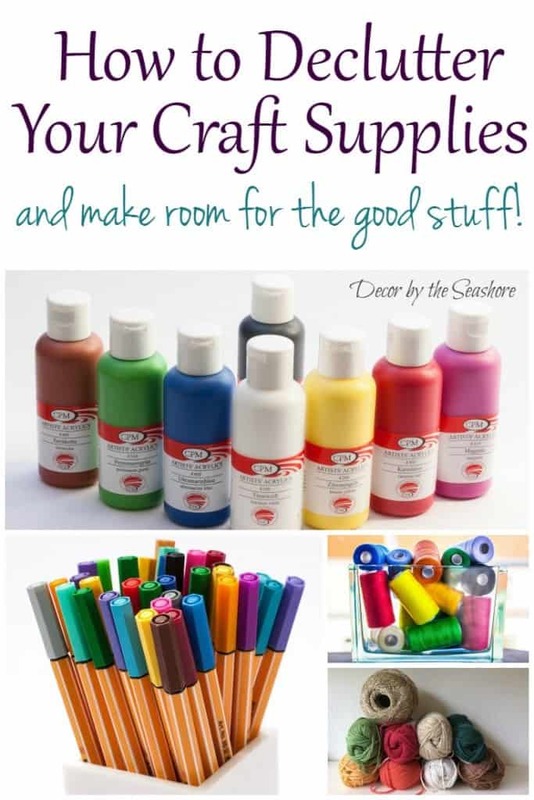 Leslie, I hope you’re able to put some of these tips to good use and get your craft supplies under control. I know it can be so hard, especially when there are certain supplies you just have so much of! Hi, what a scary thought it is to actually get ALL my craft and sewing supplies out in ONE place. I sew and embroider in my lounge, although it a dedicated space mainly for me as I have a small home and I was just about to put some more stuff under my lift-up bed so I can find room for my art stuff in the drawer that held it all. I think I might have to sort first. Do I need all those yards of coloured felt now I no longer have my embellisher (dry felting machine)? Do I really need the yarn I kept little balls of when I gave away most of it when to make room for the dressmaking dummy I bought with the proceeds from selling the embellisher. I no longer craft to sell as I got fed up of making only what would sell or repeat items and yet I still have lots of the materials and mixed media stuff I used to use. 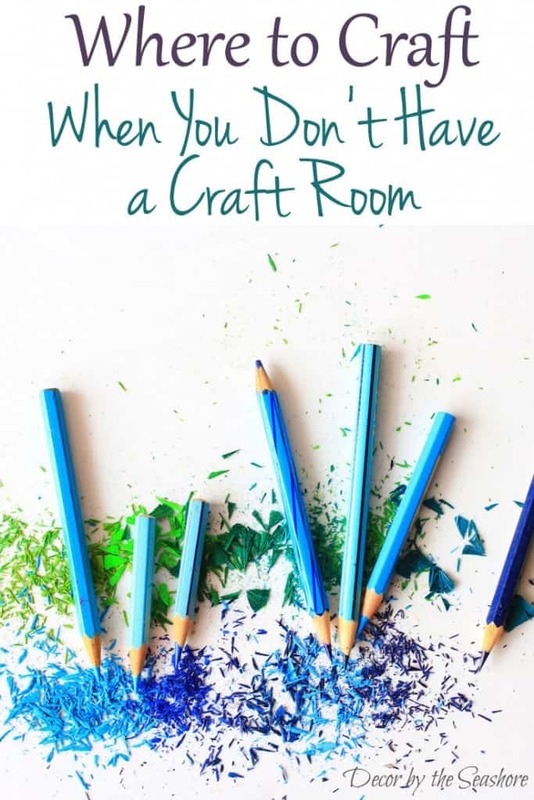 You have made me think more than any other craft declutter blog I have read and I want my space to look lovely when I’m not using it and just busy when I’m working. So here goes tonight to a start!! Thank you. I look forward to the newsletters. Gathering all those craft supplies together is such a scary thing, Angela! But it’s also super important and eye-opening! It’s amazing what we can accumulate after years of crafting, and most of it we don’t even use on a regular basis. I find that I probably use about 20% of my crafting supplies 90% of the time. The rest of them just sit there gathering dust and taking up space. We have a small house, too, so I try to just keep the things I use on a regular basis so my craft stash doesn’t get out of control. It’s definitely a good idea to give your craft supplies a good decluttering and clear out supplies you just know you’re not interested in any more and will really never use again, like your yarn and felt. That will free up some space and make your craft area much easier to keep under control and organized. I’m so glad you found this post helpful! Best of luck with your decluttering! I move in a month and I will need to have a better clue on my craft supplies. Basically I don’t want to move stuff that I don’t have to. Soooo my plan this weekend is to start sorting my craft supplies and packing them up so that they will be easy to move. If I can’t fit them in my draw system or in the fabric boxes I’m going to think long and hard about whether it’s worth keeping. Since I started working I just don’t have the time to craft like I used to and honestly it makes the time I do craft more precious. 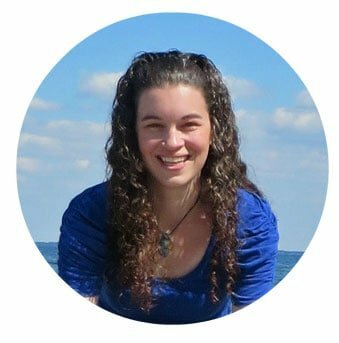 Moving is the perfect excuse to declutter and downsize, Caitlin, so that’s such a smart plan! There’s no sense bringing a bunch of stuff with you to your new place that you won’t use. I try to only keep the craft supplies that will fit in my craft cubby, too. It makes it easier to keep my craft supplies under control, and we really don’t have room for extras! Good luck with your move! Hi! I’m currently building a new craft desk/storage unit, and I have been searching for decluttering and organizational tips–I happened across your page from Pinterest, and have gotten some really useful tips–and my most exciting tip is your idea to use cute (yet semi-useless) fabric for Cases for Smiles! My mom quilts and does Project Linus (another AMAZING program for children in the hospital), and I have been wanting to do something similar! Thank you so much for sharing, there is a local chapter where I live, and I can’t wait to get involved!!! Jennifer, I’m so so happy to hear that you’ll be doing some crafting for Cases for Smiles. It’s such a great cause that is near to my heart, and it makes me so glad to know you’ll be getting involved, too! It’s a fabulous way to use up those fabric scraps and make a difference in the life of a sick child at the same time! Good luck decluttering your craft stash, and happy crafting! Not only am I a craft supply horder, but I am also a Girl Scout Troop leader, with 2 troops that range in age. I have a Kindergarten troop and a 4th-6th grade troop. Both troops love to craft, and I have so much stuff. I think I am going to go thru and purge my stash and only keep what we will actually use. I have all my meetings planned out for the whole year, so I already know what craft supplies I need for each troop. Rachel, that sounds like the perfect plan! It’s so easy for those craft supplies to get out of hand, especially when you have lots of crafting to do with your Girl Scout troops. Best of luck with your decluttering!